The Cruiser 50 is an updated version of Visionary with input from our experience with the larger C60. It is a comfortable, easy to handle, light weight, safe family cruiser for 2 parents and up to 4 kids to live on, 2 families to short term cruise on with sleeping for 8, a dining table for 8 and comfortable partying room for 20, all of whom get a seat in the shade. Compared to Visionarry, it has a more modern appearance with fewer curves going the “wrong way”. Undoubtedly, it is still a harryproa, but more stylish. Spherical rendering – View from the outside steering position. Click, pan, zoom. The lee hull has 2 big single bunks in a single or separate cabins, one of which could be made into a shower/toilet or used for storage. The windward hull has the same 2 queen size bunk layout that Visionarry has, but these are now in separate cabins, complete with their own toilet and shower. In a harryproa first, the door is offset and the saloon is not symmetrical! The saloon area is larger, with a table for 8 and a galley on the same level to allow the cook to see out and be part of the socializing. There is a multi purpose seat which can fold out into a day bed, slide across to make another seat at the table or be used to house the fridge/freezer. Alternatively, the saloon layout is easily customised to suit other layouts. The standard harryproa below deck ventilation arrangement means cool air is easily drawn in, or the boat can be closed up to keep it warm. Spherical rendering – Galley view. Click, pan, zoom. The successful fore and aft toy box from the C60 has ben included. As well as an easily accessible location for the ‘toys’, it places the winches and jammers close to the helmsman, eliminates the need for an anchor winch, places the anchor and chain storage near the centre of the boat and stiffens the bridgedeck. The toy box also provides seating for a dozen people, with another dozen on the beams and seats at the ends of the cockpit. While the ballestron rig is still an option, the schooner rig makes shunting easier and opens up the lee hull for accommodation or storage. The rig size has increased by 22%, making a fast boat considerably faster, but without any more effort. ​The result is s​ailing ​effortlessly ​at wind speed, without extras, between 5 and 20 knots​, tacking through 90 degrees and no limits on downwind sailing angles​. Most multihull sailors reduce sail at night rather than risk being caught in a squall and having to reduce sails which are flogging or pressed hard against the shrouds. The harryproa set up means the boat can be completely depowered by releasing the lightly loaded sheets (no vang loads) and the boat will drift with the sails docile and weathercocked. They can be left like this until the squall passes, be easily reefed or slightly sheeted on to provide steerage speed. The peace of mind from this is enormous. Further peace of mind comes from the unstayed rigs. There is no need to climb them or remove them to check the fittings, nor any worry about which little piece might break and cause the lot to fall down. An unstayed carbon mast needs no maintenance apart from a coat of paint every 15 years or so. The wishbone booms are lighter than the ballestron and eliminate the need for lazy jacks and all the hook ups they cause, and keep the booms clear of any unsuspecting heads. They also make covering the sails a much less onerous task. Drop the sail into the bag under the boom and pull on the zip. Reefing, raising and lowering the sails can be done on any point of sail, in any wind strength, without needing to touch the sail at any stage. 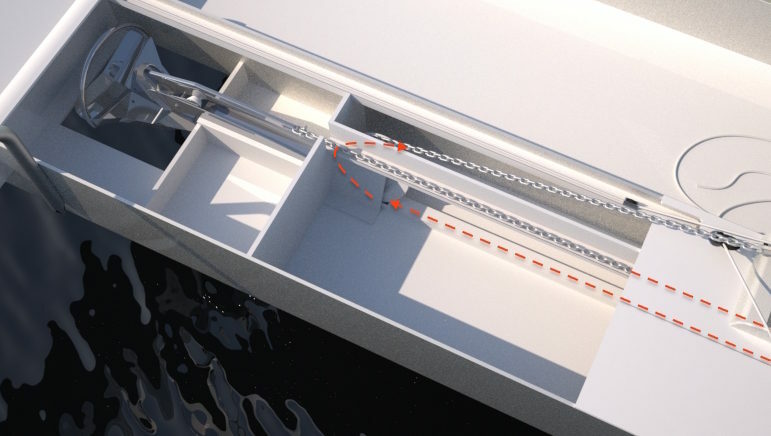 The booms are self vanging with a single control line (choker) to adjust leech and foot tension, making the sheet loads ​significantly less than they are on a conventional rig. Simple, integral, fail safe halyard locks are standard, reducing the load on the mast and the required halyard size. The halyards and sheets are lead to the winches next to the wheel so all sail handling is done from the security of the cockpit and within easy reach of the helmsman. Sail handling is easy on Visionarry, it is even easier on the Cruisers. The rudders are 2 way sections, so they can be much closer to the hull and do not have to rotate through 360 degrees. They are liftable for balance, shallow water or storm survival and kick up in a collision. In terms of drag and spray, they are a significant improvement on Visionarry. They are also considerably stronger and easier to lift and lower. The steering wheel pedestal is on a simple axle so it can be used inside or outside the cabin simply by moving the wheel. Transmission is by easily installed and adjusted low stretch line. The single wheel turns both rudders at once to steer the boat, but a simple disconnect allows them to be turned together for getting off a jetty against the wind, crabbing to windward or locking off one and steering with the other. The dinghy ramp on Visionarry works well, but limits the tender size. We firmly believe that a big tender is far more useful (longer range, more payload, higher speed, more stability, etc) and safer than a small one, as long as it can be easily handled. The Cruiser tender is 6.5m/22′ long and is attached to a substantial hinge on the back of the beam. The stern is raised and lowered with a block and tackle so it doubles as a sled for the outboard and provides auxiliary power for the mothership. ​Getting in and out of the tender ​is ​a much less risky proposition than boarding ​via stern steps. 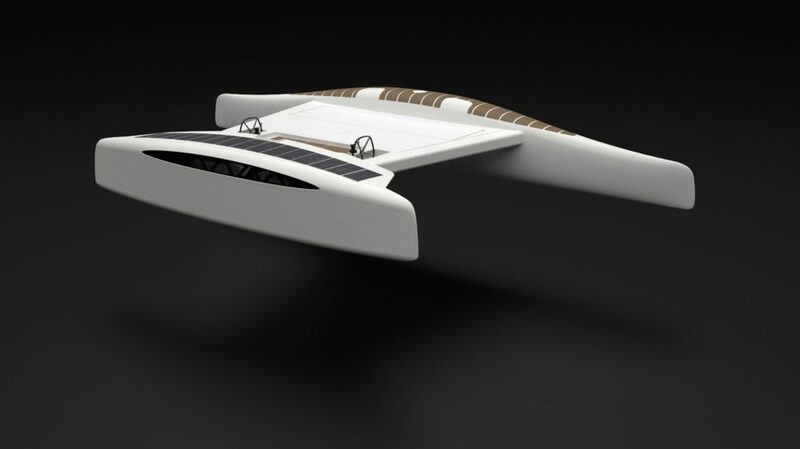 The oputboard on the tender can be large, allowing the mothership to motor at 15 knots when becalmed and the tender to exceed 25. An advantage of a seaworthy tender and a wide, stable mothership is the opening up of non marina solutions for overnight visits. Anchoring offshore becomes feasible if you can comfortably motor ashore. Saves the cost of the marina, and guarantees a peaceful night. When sailing, the tender sits flush with the deck. Access to the lee hull is via the tender deck. When the tender is not in place, a slatted deck can be rolled out to cover the gap. If a smaller tender is required, a double bulkhead can be installed and the tender split in two, with the front section suitable for rowing, sailing or a small outboard and the aft section hooked onto the beam as auxiliary. The tender is an excellent project to learn about intelligent infusion before starting on the big boat. Fore and aft rudders ​and a steerable outboard ​make manoeuvring with a single outboard a workable proposition, but for those boats which operate in tight spaces, a lightweight, liftable electric outboard could be mounted on a tube next to the helm, providing simple 360 degree thrust to push the boat in any direction. Visionarry is strip planked timber, with all the sticky, dusty mess and wastage that this involves. The Cruisers are “intelligently infused” using foam and fibreglass. Intelligent infusion includes as much of the build as possible in the infusion. All the work is done using dry materials in a simple mould which does not require sanding or polishing. What does this mean? 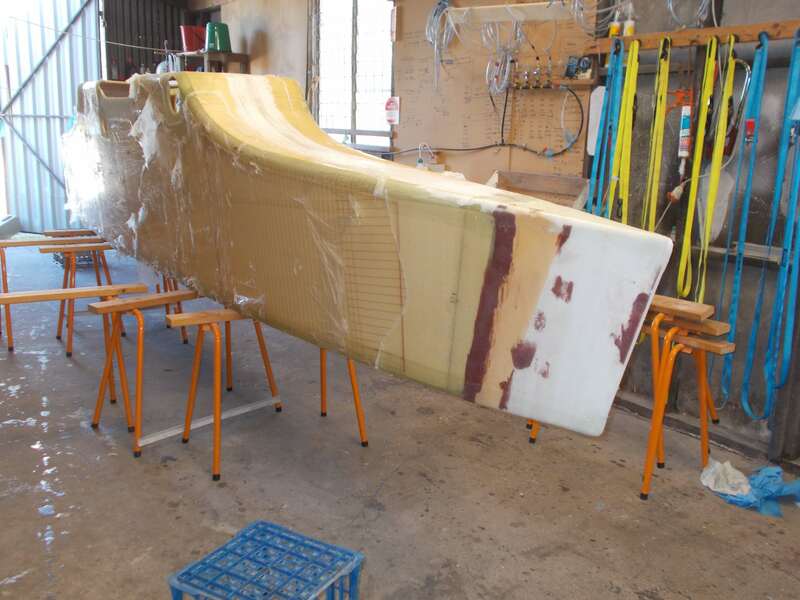 Conventional boat builders build the hull, then the deck in three stages (inner laminate, core and outer laminate) and join them together prior to the fit out which entails trimming and fitting every component, then filletting and tabbing it in place. Everything is then sanded, filled and faired prior to painting. Intelligent infusion aims to do as much of this as possible using dry, easily cut and handled materials (glass and foam) in easily made low cost moulds. Once everything is prepared, a vacuum bag is placed over it and resin sucked in (infusion). The entire job is wet out, with the perfect amount of resin, no voids and minimal waste. All in one 40 minute shot. Some of the tasks that can be included in the infusion are: perfectly fitting doors, hatches and windows and all the edging and rebates that these require; landings and edge treatments for the bulkheads, shelves and furniture; male/female joins for the hull components; solids and/or variable laminates and core thicknesses where required. All surfaces can be ready for painting or gluing, with the option of including fancy (timber, woven carbon, melamine, etc) finishes. Post infusion, the pieces are all glued together using the slots and joins. Apart from shaping and glassing the polystyrene bow pieces, there is no sanding, grinding or cutting of cured glass, no bogging or fairing and no wet laminating. The approximate material cost for the composite parts of the C50 is $AUS50,000, about what the Visionarry materials cost 15 years ago. The build time is impossible to estimate as no 2 builders are the same. Suffice to say, it will be near enough half the time it would take using conventional methods. The time and weight saved are important, the lack of dust, hard work and wastage make building a much more enjoyable job, and one that requires far less skill. Approximate Building Time: The build time is impossible to estimate as no 2 builders are the same. Suffice to say, it will be near enough half the time it would take using conventional methods. Please check with Rob for the most current price for materials. *Note: additional payload (water/fuel tanks, small generator, batteries, stowage, personal gear, etc) over and above the 2 tonnes can be added to the lee hull at the expense of speed, but not seaworthiness.